David Haber had himself a big game in this June 1990 contest, just not big enough, according to The Eugene Register-Guard. Haber picked up three hits in four at bats going into the ninth inning. He also scored a run. In the ninth, though, his team down by one with a man on first, Haber struck out, The Register-Guard wrote. Haber had that game near the start of his pro career. He played that year and the next, but he never made it out of short-season ball. Haber's career began in 1990, taken by the Royals in the 16th round of the draft out of the Catonsville Community College. He was also credited as Dave Haber. Haber went on from Glen Burnie to Valencia Junior College and Catonsville. He then caught the eye of the Royals. 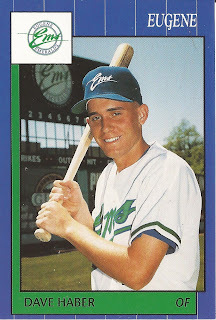 Haber went 1 for 2 with a run scored in another June 1990 game for Eugene and 1 for 3 with a run scored in another. In one game, he hit a triple that knocked in two to extend the Eugene lead. Overall, Haber got into 56 games and hit .199. He returned to Eugene for 1991. He got into 48 games that year and hit .215. That second season turned out to be his last as a pro. Haber went on to return to Maryland. In 2016, he served as a coach at a Kent Island High School sports camp in Stevensville.